SCIENCE OF DETECTING STATUS OF A PERSON BASED ON DOSHAS. Pulse diagnosis is the ancient Ayurveda science of detecting the existing status of a person’s physiological and psychological status based on Doshas. Nadi or pulse is that vital flow of energy or life that courses through body primarily in blood vessels, and enables the Vaidya to feel the way the blood spurts from the heart. Pulse reading helps an experienced Vaidya to know about Doshas, Subdoshas and their interaction with Dhatus. 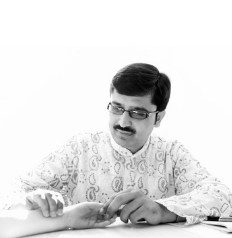 Pulse reading is to be learnt under the guidance of an experienced Vaidya through practice, and concentration. Vaidya is able to diagnose the imbalances within a person’s body by touching, pressing and feeling the different combinations of the pulse. Ayurveda reiterates that all living beings are the permutation and combination of the five basic elements – Ether, Air, Fire, Water and Earth. These five elements constitute the three major biological components – the three Doshas – Vata (Ether + Air), Pitta (Fire + Water) and Kapha (Water + Earth). Health and Disease is caused by nothing else but the balance and imbalance of these Doshas. Health follows when the Doshas are balanced and disease when they are imbalanced. There are five subtypes of each Dosha. Doshas interact with Agni (digestive fire and metabolic fire), Dhatus (Tissues) and Malas (Metabolic Waste Materials). Grossly speaking, the pulse results from pressure force through arteries that moves blood from heart to all tissues. Rate, rhythm, force and temperature are some common factors that any medical personnel or health care worker can feel. Ayurveda takes it Pulse Reading to another dimension and helps Vaidya to fetch more information from it.